QUESTION: Release… while most of today’s hunter & equitation riders use a long or short crest release, how would you score a rider that keeps the contact with the horse’s mouth, using a correct automatic release or following arm, rather than a crest release? Would there be any deductions or credit given to that rider assuming the horse jumped beautifully without rider interference? Would this affect your decision as a tie breaker? Does your answer differ in hunters vs equitation? Today in the hunter and equitation divisions we see a variety of rider releases over the jumps. “Release” refers to placement of the hands over a jump in an effort to “release” the horse’s mouth. 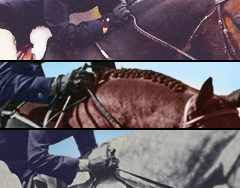 Some riders use a long crest release i.e., placing the hands from a third to halfway up the horse’s crest of his neck. The short crest release has the hands resting a shorter distance up the neck, at the base of the crest. A more advanced release is the automatic or following release where the rider never completely loses contact and the hands move down the side of the neck in complete synchronization with the horse’s mouth, resulting in a straight line from rider’s elbow to the horse’s mouth. We asked our judges which releases they prefer and how the release weighs into the round’s score.